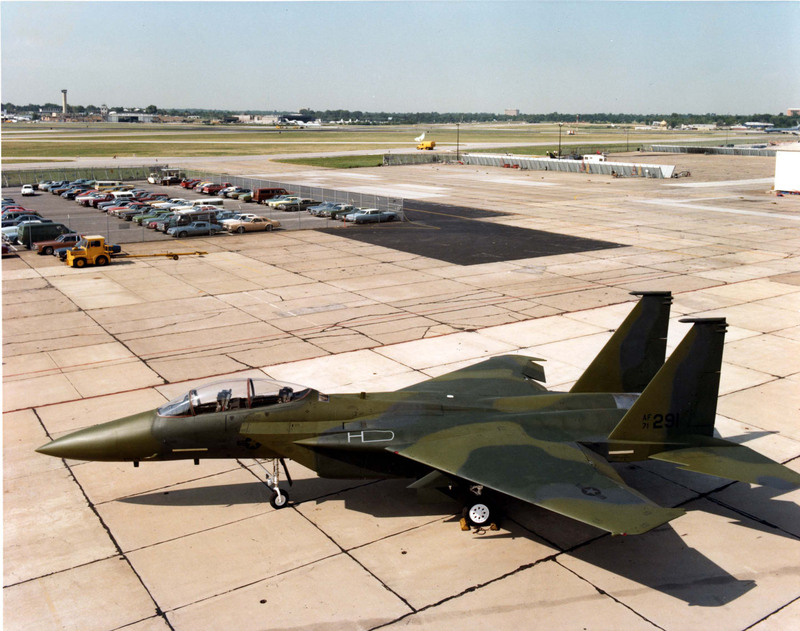 14 February 1991: An unusual incident occurred during Desert Storm, when Captains Tim Bennett and Dan Bakke, United States Air Force, flying the airplane in the above photograph, McDonnell Douglas F-15E-47-MC Strike Eagle, 89-0487, used a 2,000-pound (907.2 kilogram) GBU-10 Paveway II laser-guided bomb to “shoot down” an Iraqi Mil Mi-24 Hind attack helicopter. 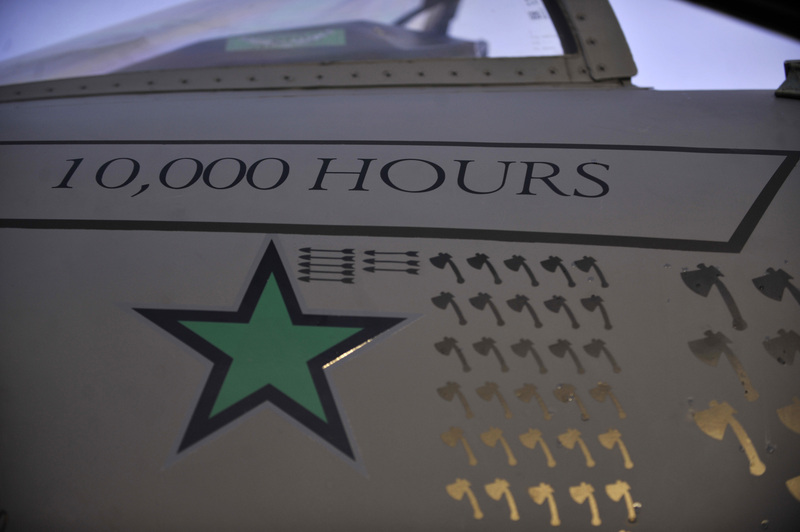 This airplane is still in service with the Air Force, and on 16 August 2016 logged its 12,000th flight hour. Captain Bennett (Pilot) and Captain Bakke (Weapons Systems Officer) were leading a two-ship flight on a anti-Scud missile patrol, waiting for a target to be assigned by their Boeing E-3 AWACS controller. 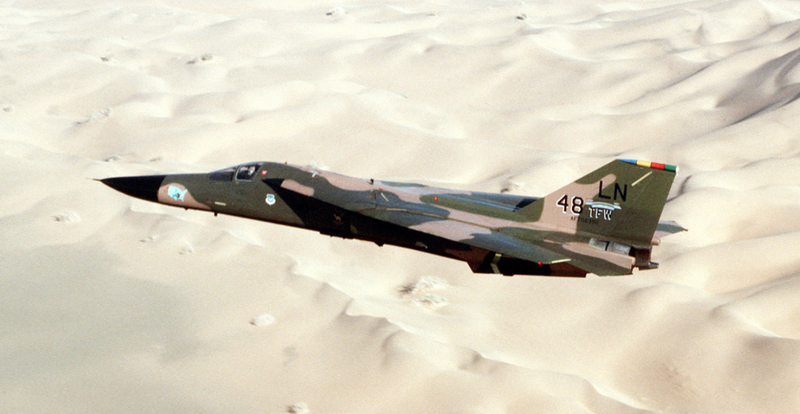 89-0487 was armed with four laser-guided GBU-10 bombs and four AIM-9 Sidewinder heat-seeking air-to-air missiles. Their wingman was carrying twelve Mk. 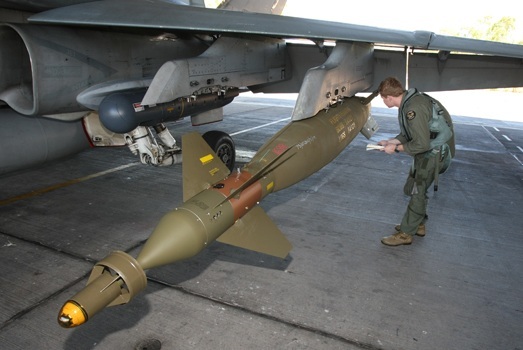 82 500-pound (227 kilogram) bombs. The AWACS controller called Bennett’s flight and told them that a Special Forces team on the ground searching for Scud launching sites had been located by Iraqi forces and was in need of help. They headed in from 50 miles (80.5 kilometers) away, descending though 12,000 feet (3,658 meters) of clouds as the went. They came out of the clouds at 2,500 feet (762 meters), 15–20 miles (24– 32 kilometers) from the Special Forces team. With the Strike Eagle’s infrared targeting pod, they picked up five helicopters and identified them as enemy Mi-24s. It appeared that the helicopters were trying to drive the U.S. soldiers into a waiting Iraqi blocking force. 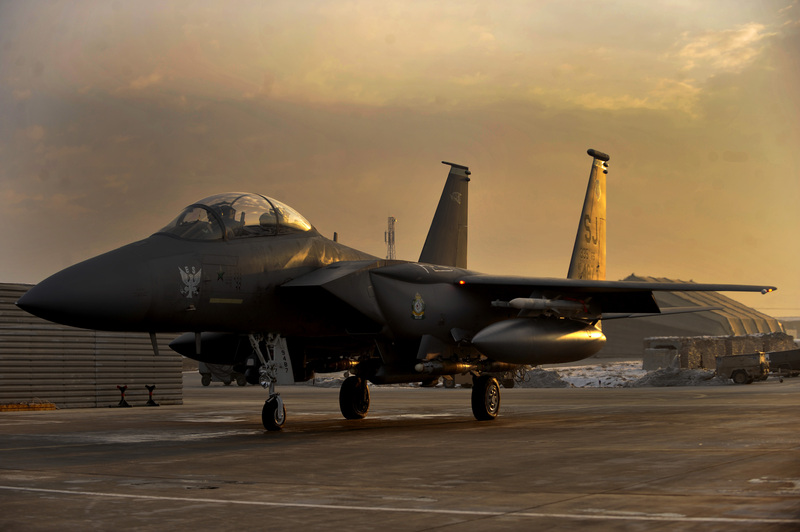 Their Strike Eagle was inbound at 600 knots (1,111 kilometers per hour) and both the FLIR (infrared) targeting pod and search radar were locked on to the Iraqi helicopters. Dan Bakke aimed the laser targeting designator at the lead helicopter preparing to drop a GBU-10 while Tim Bennett was getting a Sidewinder missile ready to fire. At four miles (6.44 kilometers) they released the GBU-10. At this time, the enemy helicopter, which had been either on the ground or in a hover, began to accelerate and climb. The Eagle’s radar showed the helicopter’s ground speed at 100 knots. Bakke struggled to keep the laser designator on the fast-moving target. Bennett was about to fire the Sidewinder at the helicopter when the 2,000-pound (907.2 kilogram) bomb hit and detonated. The helicopter ceased to exist. The other four helicopters scattered. 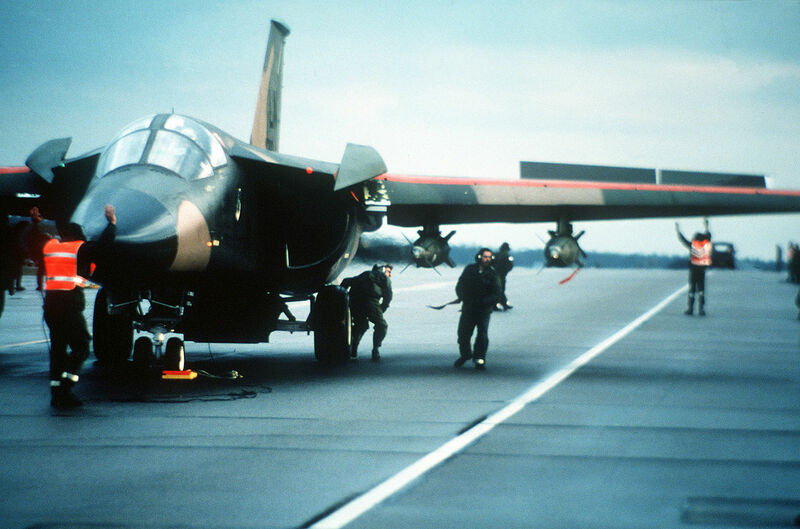 Soon after, additional fighter bombers arrived to defend the U.S. Special Forces team. 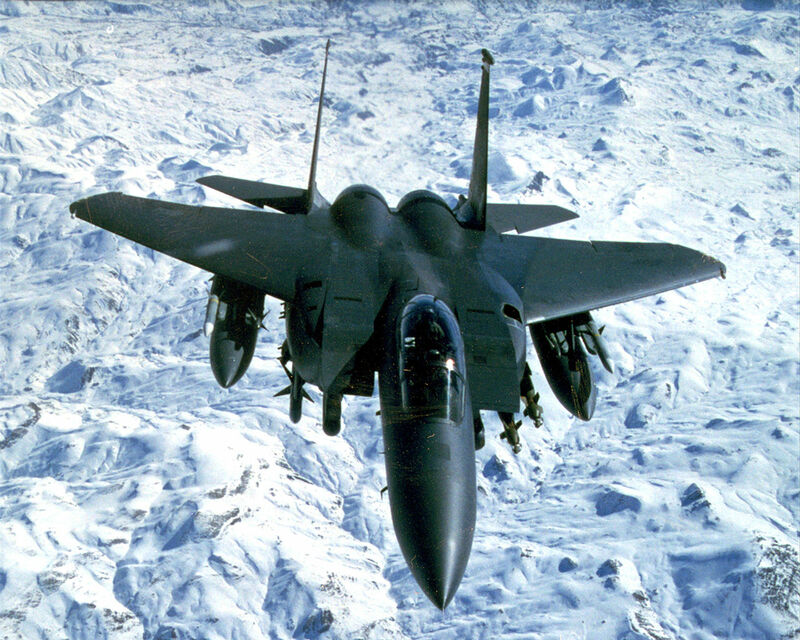 They were later extracted and were able to confirm the Strike Eagle’s kill. The Mil Mi-24 (NATO reporting name “Hind”) is a large, heavily-armed attack helicopter that can also carry up to eight troops. It is flown by a pilot and a gunner. It is 57 feet, 4 inches (17.475 meters) long and the five-bladed main rotor has a diameter of 56 feet, 7 inches (17.247 meters). The helicopter has an overall height of 21 feet, 3 inches (6.477 meters). The empty weight is 18,740 pounds (8,378 kilograms) and maximum takeoff weight is 26,500 pounds (12,020 kilograms). The helicopter is powered by two Isotov TV3-117 turboshaft engines which produce 2,200 horsepower, each. The Mil-24 has a maximum speed of 208 miles per hour (335 kilometers per hour) and a range of 280 miles (451 kilometers). Its service ceiling is 14,750 feet (4,496 meters). 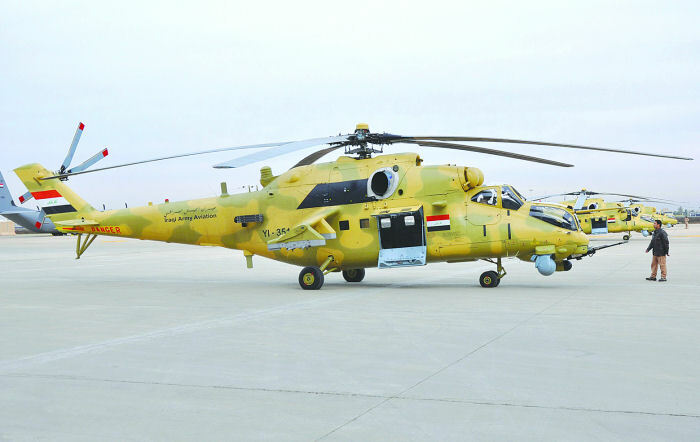 The helicopter is armed with a 12.7 mm Yakushev-Borzov Yak-B four-barreled Gatling gun with 1,470 rounds of ammunition; a twin-barrel GSh-30K 30 mm autocannon with 750 rounds; a twin-barrel GSh-23L 23 mm autocannon with 450 rounds. 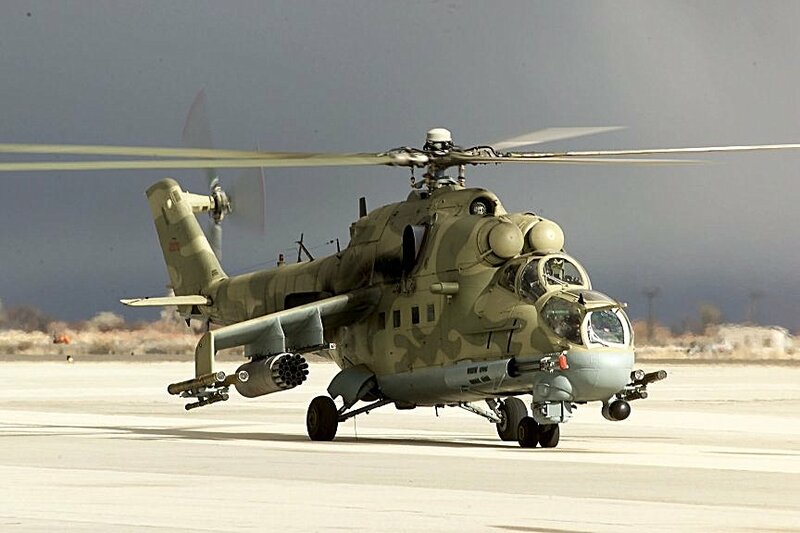 The Mi-24 can also carry a wide range of bombs, rockets and missiles. The Mil Mi-24 first flew in 1969 and is still in production. More than 2,300 have been built and they have served the militaries of forty countries.